When it comes to Hollywood, Christians too quickly wash their hands of popular culture and leave this immensely influential media to unbelievers. In truth, the industry is listening. There is a church in Hollywood, but too often their work is unrecognized. 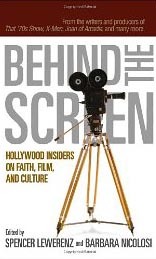 Behind the Screen offers a glimpse of Hollywood insiders who, through their jobs on movie sets, behind TV shows, and in radio broadcasts, work together to give glory to God. With contributions from the writers and producers of such productions as Joan of Arcadia, Mission Impossible, Batman Forever, That ’70s Show, and others, believers everywhere are encouraged to join with the church in Hollywood and do their part in closing the gap between Christianity and culture.